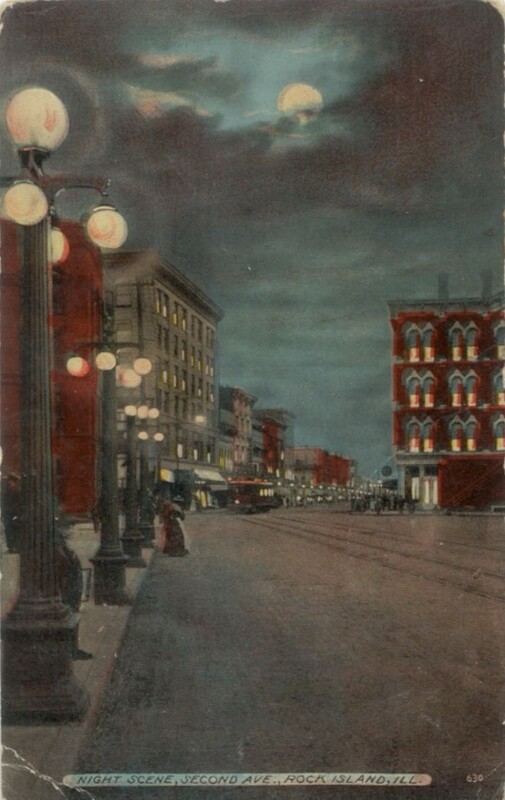 It is a typical message for this enduringly popular postcard scene where 17th Street meets Second Avenue as it bends to follow the river in downtown Rock Island. Here, the camera has captured a long full view of the business district looking east from the western fork of 17th Street. Although based on a black and white photo, colors were added before the postcard was sent to the lithographer for reproduction. At the time this picture was taken, about 1910-1915, the downtown extended all the way from 14th Street to the depot on 20th Street. The old State Bank, later to become First National Bank, is at the far left. Beyond that is the Best Building, which had been erected in 1908. In later years, it was called the Plaza Office Building and, more recently, the VanDerGinst Building. Other structures line the north side of Second Avenue, with a red color simulating brick intermittently applied to the original black and white image. Near the eastern end of the street is the Star Block. On the far right, adjacent to Market Square, is the old Bengston Block, complete with ornate arched window trim, as it appeared before it lost its upper stories in the 1940s. Is it really a night scene? That’s doubtful. Although the moon, streetlights, and building interiors all glow with light, the brilliance of them seems unreal. The clouds that partially cover the moon are just a bit too picturesque. A woman stepping off the curb by the bank as the streetcar approaches would be a blur in the time exposure needed for a nighttime photo in that era. Yet despite the painted enhancements, the postcard still presents an evocative image of a quieter time. Just as the sun has set in the picture, it must now set on the Postcards from Home series. For the past seven years, beginning May 13, 2001, the Rock Island Preservation Society has taken a journey through Rock Island’s history, sending you postcards, nearly 200 of them, from spots along our route. During the first two years, these stories in the Dispatch/Argus appeared weekly. Later the frequency was reduced to twice monthly, and, even later, monthly. While we have enjoyed the trip, we’ve sent all our postcards and must therefore bring this journey to an end. Thanks are due to those who have provided material for the series. Starting out with postcards owned by our members, the need for more became quickly apparent. Some postcards came from the archives at the Rock Island Public Library, Rock Island County Historical Society, and Augustana College Library Special Collections. Individuals have been extremely generous about sharing extensive personal collections and allowing us to reproduce their postcards. Many of these privately owned postcards were one-of-a-kind created from photographs printed on postcard stock 75 to 100 years ago. The research archives at the Rock Island County Historical Society were an invaluable resource of information. The volunteers there continue to clip and catalogue the daily newspapers to ensure that researchers of the future will be able to tell stories about our era just as efficiently. These postcard topics included houses, from modest to mansions; parks and parades; depots and dams; churches and conflagrations; bridges and businesses, from miniscule to major; and people. Standing behind every building are the people who wanted it, who needed it, who built it, and who used it. This series introduced you to some of them. Sometimes the message written on the back was as interesting as the picture, whether from a tourist praising the city or a native updating a friend. In one instance, the cryptic message on the back — “April 2, 1912. This is scene of the riot. From Willie” — made it possible to identify the close-in view as the aftermath of a city shut down when John Looney’s hoods instigated a riot that resulted in 600 National Guardsmen being sent here to calm the populace. Many of the postcard buildings are still standing in excellent condition, loved and appreciated. Far too many have been lost, sometimes through negligence or accident, but too often in the name of a progress that ends up meaning a parking lot. Too rarely, an outstanding building is replaced by another equally outstanding – as example, an architecturally outstanding YMCA building once stood on the site now occupied by the equally outstanding Circa 21. The odyssey has been educational for the authors as well. As we reexamined the buildings and the people who shaped our past, we have also been entertained by unexpected discoveries along the route. We hope that our readers have gained an appreciation for history and our historic architecture as a context for the future. So our postcard travel through Rock Island’s past ends, at least on a scheduled basis. New postcards may come to light that have another story to tell. We’ll be there to tell it. Had a wonderful time; Glad you were here! This article by Diane Oestreich is slightly modified from the original, which appeared in the Rock Island Argus and Moline Dispatch on May 4, 2008.